Cambridge, MA — January 23, 2019 — Sustainable Minds® (SM), recognized leaders in customer-centered product sustainability cloud solutions, today announced the availability of the Transparency Catalog  v2.0, continuing the company’s commitment to deliver simple, easy to use and powerful tools. 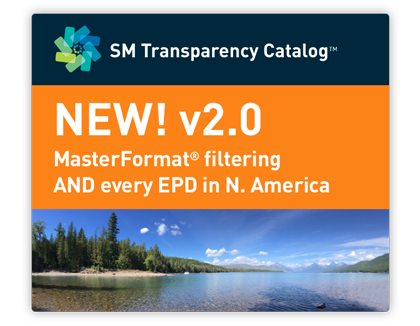 Flexible MasterFormat® number filtering, aligned with MasterSpec® sections, enables AECOs to find exactly the brands, products and transparency disclosures, in each division and section, to meet project and green building rating system requirements. This makes it possible to do in minutes what today takes weeks, or wouldn’t even be possible to do at all. Six green building rating systems  in North America now offer credits for installing products from MFRs that have disclosed the findings of these studies. Rating systems incentivize AECOs to specify products with transparency disclosures with the ultimate goal of being able to select actually higher performing products that result in higher performing buildings.